The small businesses play a far more important role to our economies than before. In particular this relates to technology companies. Springboard UK is an initiative aimed to meet the demands of the small and medium sized technology companies (SMEs), to become active players in the global market. A survey amongst South East England oil and gas suppliers undertaken by Douglas-Westwood Associates in 2002 for the Department of Trade and Industry (DTI) revealed that the form of assistance from government considered most important overall were those relating to setting up an overseas office and those relating to accessing networks to find clients and projects. The help with overseas set-up costs were seen as the least available forms of assistance, especially for the smaller companies. Presence at trade shows and conferences in key markets had major cost implications and prevented SMEs to take part. To meet the demand of the growing number of SME companies in accessing foreign markets the Springboard UK concept developed. UK and Norway are neighbouring countries, and together they share the most important offshore oil & gas province in the world. UK is further the most important trade partner to Norway. Many of the large Norwegian companies have set up in the UK, as have large UK companies in Norway. However, for the smaller companies, such cross border integration has been insignificant. Costs are preventive for many, however also different business culture has prevented collaboration to develop. British people are the biggest traders in the world – they spend a lot of time in networking, establishing contacts, and maintaining contacts – they trade with the people they trust and know. In Norway, a much smaller country, the opportunity for making a meeting appointment and achieving a decision is so much smaller than in the UK. Many Norwegian small businesses set up representations in the US and Far East, and arguing that “The UK – we can handle from home”. The UK has some of the world leading technology parks, often located close to Universities and larger global companies. The parks often include a centre for smaller companies. After an “incubation” period the companies grow into a larger unit in the surrounding area, or they find another suitable location. They spend a lot of time networking, not only amongst the technology park tenants, but also towards the Universities for those into research development, and with the larger global companies. An evaluation for the need of a “Springboard” concept was done amongst Norwegian Technology companies, with the help of students from the Norwegian School of Management. The results of these surveys gave a very clear conclusion that such an initiative would be most welcomed and needed. Also, for the technology sectors considered, the UK stands out, together with the USA, as clearly the most desirable export market. The companies also considered the UK as an important step-stone towards other export markets. The first Springboard UK office was established at the Surrey Research Park last spring. The technology park is conveniently located south west of London, between Heathrow and Gatwick airports. It is one of the largest UK technology parks, where 1/3 of the companies are foreign. In the area are located some of the world “globals”, such as Pfizer, GSK, BP, Halliburton, Nokia, SonyEricsson. A number of large overseas oil and gas projects are run from project offices in the area. Last autumn, the second Springboard office started opened the Aberdeen Science and Technology Park of particular interest to Norwegian oil and gas suppliers. A third of the companies in the park are foreign, for example KongsbergSimrad and Weatherford. 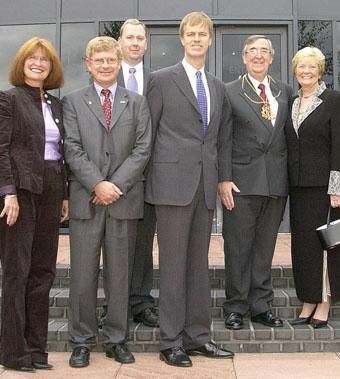 The third Springboard office will officially open in the Manchester Science Park 20 February 2004. Already onboard are Fluma Technology and Bergen Energy. The North West and Manchester is the largest economic centre in the UK after the South East and London. The Science Park is located close to Europe’s largest University campus and the centre of Manchester. The Springboard initiative is still in its birth stage, and we will in the time ahead closely monitor how the companies develop. Already, we see examples that Springboard companies establish partnerships and contracts. We are also pleased to see that the initiative is followed up by an initiative by the British Ministry of Trade and Industry to establish a similar centre for British SME companies at the Rogaland Research Park – making it a true cross-border collaboration scheme. From the opening of the Aberdeen Springboard UK office. 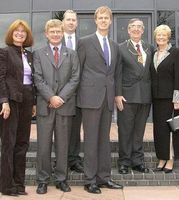 From left: Mrs. Randi Hestnes, Director Overseas Operations Innovation Norway; Hans Peter Christophersen, Springboard UK Director Innovation Norway; Tony Aldous, Director Aberdeen Science and Technology Park; Stephen Timms, UK Minister of State for Energy; Lord Provost of the City of Aberdeen – Councillor John Reynolds and Lady Provost.